Mad Hatter's Reading Log Vol 3. Bantam Books, an imprint of the Random House Publishing Group, announced today the acquisition of the comic book and graphic novel rights to the worldwide bestselling A Song of Ice and Fire series by George R.R. Martin. The series will be illustrated by Tommy Patterson and adapted by Daniel Abraham, the award-winning and bestselling author of The Long Price Quartet. The first issue of the monthly comic-which will be published by Dynamite Entertainment-is planned to release in late spring 2011, with compilations of the comics in graphic novel form to follow under the Bantam imprint. 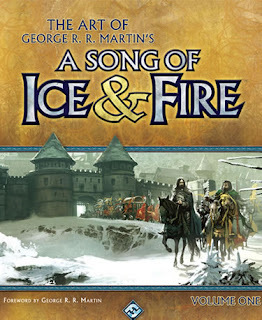 With the television adaptation of A Game of Thrones scheduled to air on HBO starting in April 2011, the comics and graphic novels will further expand the Song of Ice and Fire series into a new medium, creating opportunities for readers old and new to immerse themselves in this bestselling world. Some may remember Dynamite from my article last year about them buying the rights to all the properties held by Dabel Brothers including the Dresden Files and Wheel of Time graphic novels. Dynamite expects the first issue to be release in late Spring with Bantam doing the collected trade editions. Tommy Patterson is the artist slated to work on the series and a couple samples of his take on the characters has been released. Martin also mentioned there was second announcement that was supposed to be made in January. And speculation runs rampant about A Dance with Dragons yet again. Fingers crossed! Another unnecessary addition to GRRMs merchandizing delusion. TV series and books are enough. Bring out aSoIaF part 5-7 or 8 and not stuff no one is interested in.